Not to be confused with The Missing. Missing is a 1982 American historical drama film directed by Costa-Gavras and starring Jack Lemmon, Sissy Spacek, Melanie Mayron, John Shea, Janice Rule and Charles Cioffi. It is based on the true story of American journalist Charles Horman, who disappeared in the bloody aftermath of the US-backed Chilean coup of 1973 that deposed the democratically elected socialist President Salvador Allende. The film was jointly awarded the Palme d'Or (with Yol) at the 1982 Cannes Film Festival. Set largely during the days and weeks following Horman's disappearance, the movie depicts his father and wife searching to determine his fate. The film examines the relationship between Horman's wife Beth (Spacek) and her father-in-law, American businessman Ed Horman (Lemmon). The film was banned in Chile during Augusto Pinochet's dictatorship, even though neither Chile nor Pinochet are ever mentioned by name (although the Chilean cities of Viña del Mar and Santiago are). The film opens with Costa-Gavras' statement that the events of the film are true. At first, When Ed arrives in the Latin American country where his son Charles Horman worked, Ed blames his son and his radical political views for his disappearance, but he is later crushed when discovering that the government he reveres so highly has been involved with his son's disappearance and possible death as a collaborator of the dictatorship. As a bookend of sorts to Costa-Gavras' assertion that the events of Missing are true, the film ends with a postscript stating that after his return to the United States, Ed Horman received the body of his son Charles seven months later (making an autopsy impossible), and that a subsequent lawsuit against the US government was dismissed. It also adds that the State Department denies their involvement in the Allende coup, a position maintained to the present day. 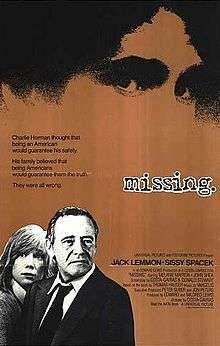 Missing is based on a book that was first published under the title The Execution of Charles Horman: An American Sacrifice (1978) by Thomas Hauser (later republished under the title Missing in 1982). The score is by the Greek electronic composer Vangelis. The movie's piano theme has been used extensively in commercials, but an official release of the film's soundtrack has not yet occurred. The main theme appeared first on Vangelis' 1989 album Themes. The main theme is also available on the Festival de Cannes (60th Anniversary) compilation of famous soundtracks. A bootleg release of the soundtrack exists. A sung version with lyrics by Tim Rice has been recorded by Elaine Paige & Nana Mouskouri. The film was released on both VHS and Laserdisc, in 1982 and 1987, by MCA Videocassette, MCA Videodisc, and MCA Home Video respectively. The VHS version was pulled from the market due to the lawsuit filed against director Costa-Gavras. Universal Home Video re-released Missing on DVD in 2006, following the dismissal of the lawsuit. A special edition DVD was released by The Criterion Collection in October 2008. Both the film and Thomas Hauser's book The Execution of Charles Horman were removed from the United States market following a lawsuit filed against Costa-Gavras and Universal Pictures's (then) parent company MCA by former ambassador Nathaniel Davis and two others for defamation of character. A lawsuit against Hauser himself was dismissed because the statute of limitations had expired. Davis and his associates lost their lawsuit, after which the film was re-released by Universal in 2006. Missing won the Palme d'Or (Golden Palm) at the 1982 Cannes Film Festival, where Lemmon was awarded Best Actor for his performance. ↑ Costa-Gavras Plans to Make Film in Israel. The New York Times. Published December 1, 1982. ↑ "Missing (1982)". Box Office Mojo. Retrieved May 2, 2016. ↑ Box Office Information for Missing. The Numbers. Retrieved March 27, 2013. 1 2 "Festival de Cannes: Missing". festival-cannes.com. Retrieved 2009-06-12. ↑ "Oscars.org -- Missing". Academy of Motion Picture Arts and Sciences. Retrieved January 17, 2014.